Sarah Crichton Books, 9780374267704, 386pp. "Going from peace to war can make a young man into a warrior. Going from war to peace can destroy him." Conrad Farrell has no family military heritage, but as a classics major at Williams College, he has encountered the powerful appeal of the Marine Corps ethic. "Semper Fidelis" comes straight from the ancient world, from Sparta, where every citizen doubled as a full-time soldier. When Conrad graduates, he joins the Marines to continue a long tradition of honor, courage, and commitment. 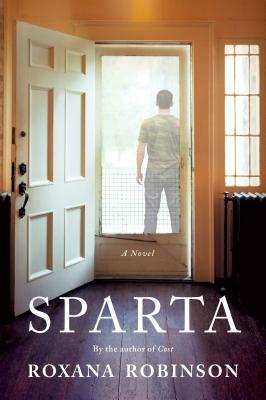 As Roxana Robinson's new novel, "Sparta," begins, Conrad has just returned home to Katonah, New York, after four years in Iraq, and he's beginning to learn that something has changed in his landscape. Something has gone wrong, though things should be fine: he hasn't been shot or wounded; he's never had psychological troubles--he shouldn't have PTSD. But as he attempts to reconnect with his family and his girlfriend and to find his footing in the civilian world, he learns how hard it is to return to the people and places he used to love. His life becomes increasingly difficult to negotiate: he can't imagine his future, can't recover his past, and can't bring himself to occupy his present. As weeks turn into months, Conrad feels himself trapped in a life that's constrictive and incomprehensible, and he fears that his growing rage will have irreparable consequences. Suspenseful, compassionate, and perceptive, "Sparta "captures the nuances of the unique estrangement that modern soldiers face as they attempt to rejoin the society they've fought for. Billy Collins writes that Roxana Robinson is "a master at . . . the work of excavating the truths about ourselves"; "The Washington Post"'s Jonathan Yardley calls her "one of our best writers." In "Sparta," with the powerful insight and acuity that marked her earlier books ("Cost," "Sweetwater," and "A Perfect Stranger," among others), Robinson explores the life of a veteran and delivers her best book yet. A "Washington Post "Notable Fiction Book of 2013. Roxana Robinson is the author of four previous novels, three collections of short stories, and the biography Georgia O'Keeffe: A Life. Her work has appeared in The Atlantic, The New Yorker, Harper's Magazine, The Washington Post, The Wall Street Journal, More, and Vogue, among other publications. Explore the novel’s title. How does the description of Spartan life in chapter 4 compare to the life of a U.S. soldier in the twenty-first century? Why was Conrad drawn to classicism? Did he experience any of those ideals as a modern American warrior? If you were in Claire’s position, how would you respond to Conrad’s homecoming? Ultimately, what does he need from her, and from all his loved ones? What makes it hard for him get his needs met without turning people away? What are some of the differences between Marshall’s and Lydia’s approaches to their children? Despite her career as a successful therapist, why is Lydia mystified by Conrad’s symptoms, culminating in chapter 24, when she rejects his rage by telling him, “I can’t stand this. Con, you have to do something about this”? How did Ali change Conrad’s perspective on privilege and political struggles? What common fears did they share? As Conrad observes the dramatic changes in Go-Go’s value system, what does he discover about the way he and his friends have changed since graduation? Are we our true selves during our college years, or is that just an experimental phase? Do the demands of adulthood transform us into our true selves? From chapter 5, where the factions of Fallujah are explained, what clarity did you gain? How did an American soldier’s duties in Iraq compare to those of armed forces in Vietnam and Korea? While being with Jenny, what does Conrad discover about growing older and the changes that took place while he was away? As he walks familiar ground in Katonah and Manhattan, what has changed within him? What did his military service cost him? What does Conrad’s heartrending experience with the VA and his session with Dr. Chandler reveal about the high suicide rates among U.S. soldiers and veterans? What would it take to fully fund psychiatric care in the military and rank it alongside weapons and armor in importance? As Conrad remembers Carleton, Olivera, Anderson, and others, what emotions does he experience beyond guilt? How does his network of survivors cope with the seemingly trivial, naive nature of civilian life? Everyone in Conrad’s world seems to have a purpose tied to meaningful work. Despite his damaged psyche, Conrad tries to find a new mission, enrolling in an economics class and forcing himself through the GMAT. How did his perception of a meaningful life radically change when he enlisted? What truths are finally spoken at the end of chapter 24? How does the Farrells’ response to trauma compare to your family’s? Throughout the novel, Conrad told himself that he must keep certain truths from his family. Was he right? What makes Conrad’s relationship with Ollie special? What is Ollie able to see and do that the other family members—and the VA clinician—can’t? In what ways can fiction sometimes capture reality better than a history book? How did Conrad’s story affect your understanding of the challenges faced by veterans and the aftermath of modern warfare? What themes of healing are woven throughout this and other fiction you’ve read by Roxana Robinson? What is both unique and universal about Conrad’s experience?